Jean and “Kitty” Whyte (Daughter of shark attack victim died exactly 77 years to the day later) | Marine Life Society of South Australia Inc.
“Kitty” Whyte was SA’s first known shark attack victim. In March 1926, she had been giving swimming lessons to some children at Brighton jetty when she was attacked by a 3-4m shark She was subsequently rescued by two men in a boat, but she apparently died on the beach. I previously documented Kitty’s death in two past MLSSA Newsletter issues (Nov. 2011 and Feb. 2012). My two-part report regarding Kitty’s death gave the date of her death as 17th March 1926. I now see that most reports give the date as 18th March, rather than 17th March. My reason for bringing this matter up once more is because Kitty’s daughter, Jean Whyte died in Melbourne on 18th March 2003. This is said to be “77 years to the day” that Kitty herself died in 1926. This must be particularly sad for any remaining family members, with both mother and daughter having died on the same date. Jean was just two years old when her mother died in 1926. She spent her first ten years at a sheep station north of Port Augusta called Yadlamalka. She and her sister Phyllis later attended St Peter’s Collegiate Girls’ School. Jean went on to become a librarian and then Professor of Librarianship at Monash University in 1975. She retired in 1988 and has been given many awards, including Member of the Order of Australia in 1988. She was 79 years old when she died in 2003. Jean had a second Christian name of ‘Primrose’, which came from her father, Ernest Primrose Whyte. Her mother, Kitty is often referred to as being Mrs Primrose Whyte, after her husband. The inscription on the grave reads: – “Sacred to the memory of Kathleen Campbell Whyte, beloved wife of E. Primrose Whyte & loving daughter of late Rev. Alex Macully of Dunluce, Brighton & Mrs Macully of Dunluce, Glenunga (nr. Glenside), who passed away 18th March 1926, aged 35 years”. This is followed by a quote by Sir Edwin Arnold: – “Perfect service rendered, duties done In charity, soft speech & stainless days: These riches shall not fade away in life Nor any death dispraise” (From The Light of Asia by Sir E. Arnold). There is a family grave & headstone adjacent to Kitty’s. 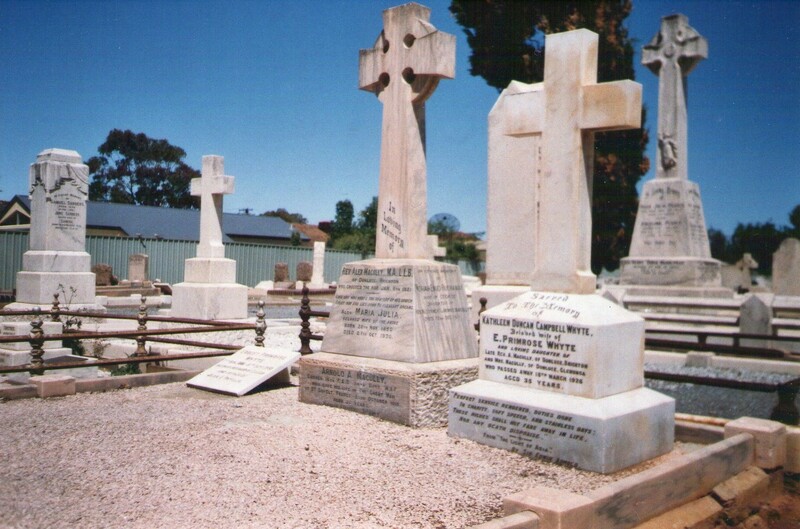 It includes the grave for Kitty’s husband, E. Primrose Whyte. 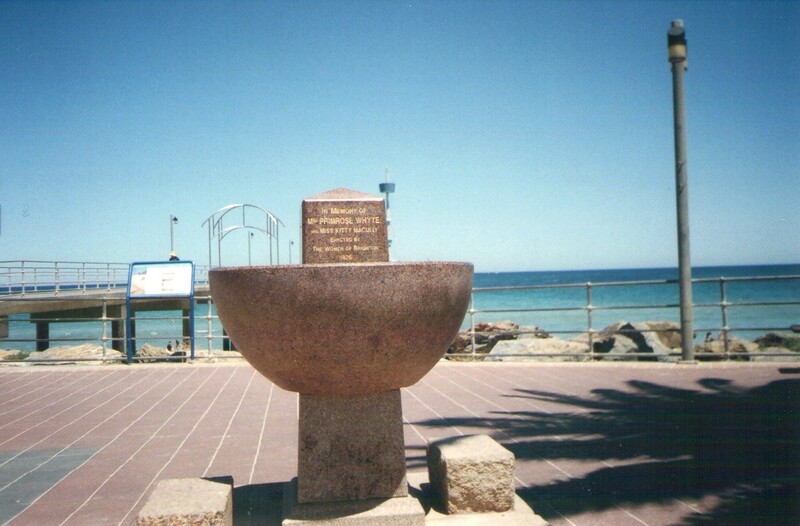 There is a memorial granite drinking fountain in memory of Kitty at Brighton jetty. It had been donated by the “women of Brighton” in 1926. 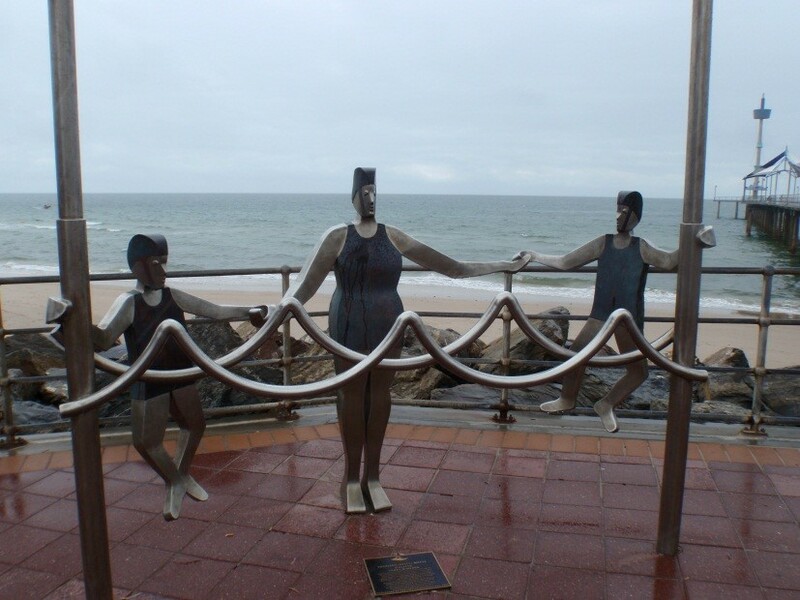 This new sculpture has been placed near the entrance to the Brighton jetty. 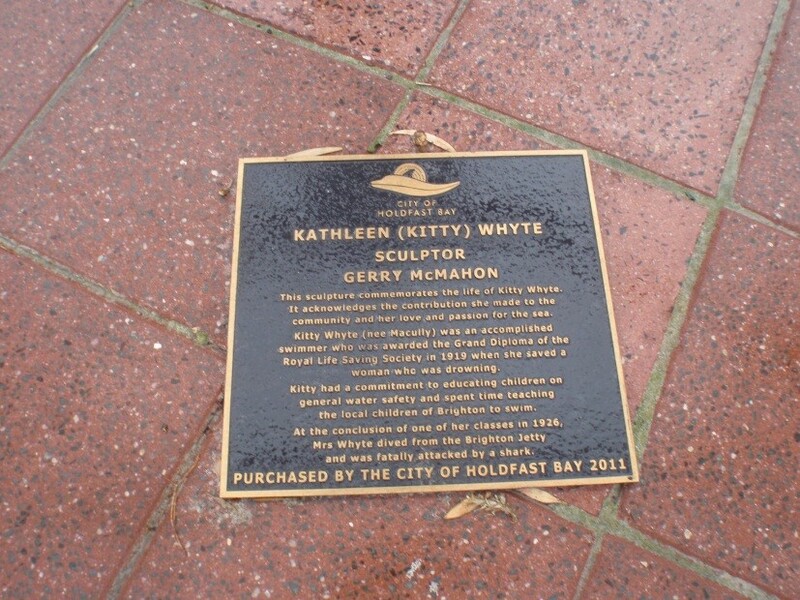 It was commissioned by the Holdfast Bay Council. The sculpture is made from stainless steel and copper. It portrays Kitty frolicking in the water with two children. The sculpture is the creation of artist Gerry McMahon. Just to recap a little, it is quite sad that both mother and daughter died on the same date, 77 years apart.